You should also read “A Canticle for Leibowitz.” Pretty solid post-apocalyptic book. That book was pretty righteous. Done mostly in flashbacks. A good’un. .-= Angela´s last blog ..The Great Shattering =-. Man, I should have talked about books sooner! I’ll look for Dies the Fire next. Thanks everyone! dude … dies the fire is a gigantic obligation. It’s in the second series now. and also the ‘island in the sea of time’ series. as one drunken goon to another — it’s a large task to take on. but worth it. .-= Tim the Second´s last blog ..The Stand at the half way point … =-. 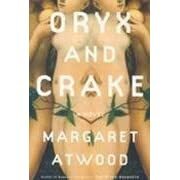 I think Oryx and Crake is one book of a series where the lives tie into one another. Also read Atwood’s novel, “The Year of the Flood” if you haven’t yet. It’s very good. Jimmy’s life ties into it as well. I’m starting Oryx and Crake now. I hope it was good? okay…i’m reading this post rather late….the other book you should read by margaret atwood is ‘the handmaid’s tale’…keep in mind when it was written…great book. i reread it every five or six years. you should also read Go Go Girls of the Apocalypse. PLEASE ignore the cheesy cover. Everyone I’ve lent the book to…and this includes non-sci fi nerds … reads it in record time. i have the short story collection you mention later, too. It’s not too good. I’m a demanding reader and if there’s dialogue, it has to be good, she said. (yeah, not like that). there are maybe two stories in the collection that are decent and the rest i found boring, completely unrealistic or just poorly written. I recommend Go Go Girls and then The Handmaid’s Tale. though be warned…the handmaid’s tale is very subtle and only truly frightening in exactly how you can see that future actually happening. Thanks Mel! I just started The Algebraist (sp?) so I’ll check out those two books next. Also check the 1969 (an apt year [if ever there was one] for post-apocalyptic work) ‘Heroes and Villains’ by Angela Carter. ‘Heroes and Villains’ is sounding really familiar. I’m thinking that I have a copy of it somewhere. I’ll check it out, though. Thanks much! Check Chester Himes’s Plan B , too – an out-of-hand massacre of the US white population by the disgruntled black population. Putting all accusations of racism aside, I couldn’t help think of the 1972 Conquest of the Planet of the Apes when reading this; a movie where slaves stage an uprising against their white oppressors. .-= partikal5´s last blog ..Get Up… =-.